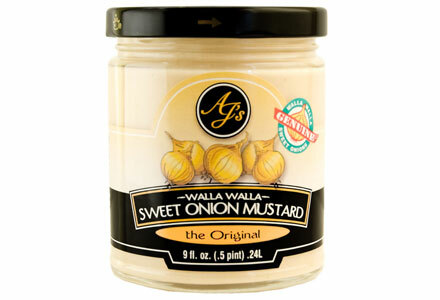 Home of AJ's Walla Walla Sweet Onion Mustard - AJ's Edible Arts, Inc.
Based in the beautiful Columbia River Basin, AJ’s Edible Arts, Inc. specializes in hand made mustard, sauces, dry mixes, and other fine gourmet food products. AJ's Edible Arts, Inc. is a woman owned business based in Pasco, Wa. We specialize in hand crafted mustards, sauces, dry mixes, and gourmet gift boxes. You can find AJ's Edible Arts, Inc. products in over 300 locations in the United States. Click to find out if there's a store near you.